The other day I wanted to expose my son to some high-brow entertainment. You know, I wanted him to learn to appreciate the finer things in life–higher culture. Things like Mozart, Shakespeare, and of course, The Little Rascals. 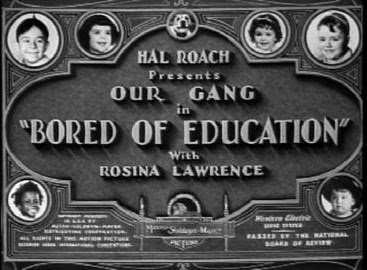 So, we sat down to watch an episode of The Little Rascals called “Bored of Education.” It was so titled because the little darlings were, you see, bored of education. It is the first day of school, and the kids are suffering now that summer has come to an end. They march up the school steps with a pitiful resignation. But! Never fear: Spanky has a plan. He has Alfalfa pretend to have a toothache and for realism, Spanky stuffs a balloon into his friend’s mouth. Meanwhile the dastardly antagonist (Miss Lawrence, their teacher) has ordered ice cream to be brought for the kids to enjoy. But, you see, Alfalfa and Spanky only learn of this development once excused from school, Alfalfa due to his “toothache” and Spanky to walk his poor friend home. Hearing Alfalfa’s flawless delivery, I immediately looked it up. This song was written by the Irish poet, Thomas Moore, and set to a traditional Irish air. It was said Moore’s wife, Elizabeth, refused to leave her room due to her face having been badly scarred by smallpox. She was convinced her husband would no longer love her. The same look which she turn’d when he rose! The story goes that after the poet finished singing, the door opened and the husband and wife were reunited.